A beautiful old native fig tree – showing evidence of getting a bit thin on top! How many hats do you have? On Saturday I had to put on one of the many I seem to juggle – this one was Di the arborist ( I also needed my thinking cap!). Now, it’s been a long time since I climbed a tree with a chainsaw hanging from my belt, but I can still tell a healthy tree from a sick one. This one was definitely under stress. 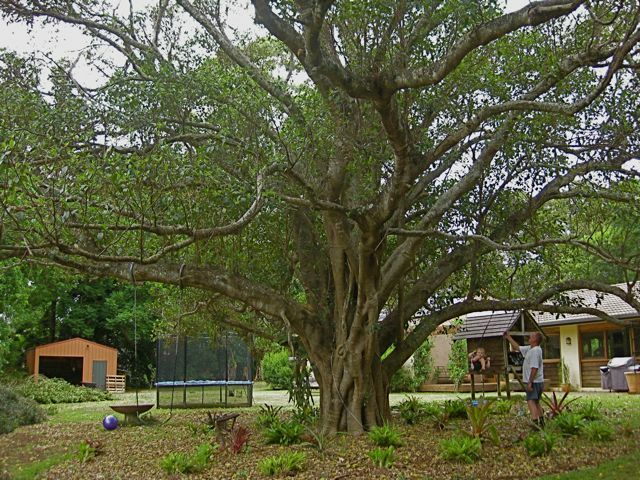 Lisa and Marcus had called me up about their fig tree – we are talking about an over one hundred years old Moreton Bay Fig (Ficus macrophylla), a significant tree and one that they really love. It is the focal point of their property, providing shade, branches to swing from and a sedate backdrop from the house. Why did they call me – because it was dramatically shedding it’s leaves i.e. the crown was thinning. So what are they key things I look for when a tree is beginning to lose it’s vigour? This bit of detective work will help you solve the problem. Here is a checklist that you can follow and WHAT TO DO TO REMEDY THE PROBLEM. 1. How does the canopy look? This one was thinning – losing it’s leaves. Sudden decline, or death of a tree, is almost always a root problem – so think about what is going on there first. Remember – the answer lies in the soil! 2. How does the trunk look – any signs of splitting, cracking or insect attack (borers leave tell-tale holes , webbing and sawdust). None of the above. Splitting is usually a sign of excessive over or under watering (sometimes, but rarely, a lightening strike). 3. Any recent disturbance to the roots or soil above the roots. Yes, this had landscaping machinery running over it recently causing compaction. Roots thrive on air and water. If they are cut-off, disturbed, poisoned, compacted – THE TREE WILL NOT THRIVE. WHAT TO DO: The best way to remedy soil compaction problems is to aerate it. Now you can do this by having a big garden party and asking everyone to wear high heels OR you can hire an aerator – a kind of roller with spikes on it. NEXT you top-dress the area with a free-draining soil mix. Most landscape suppliers will have a bulk top-dressing mix specifically for this purpose. 4. Any signs of disease or insect attack to the leaves. 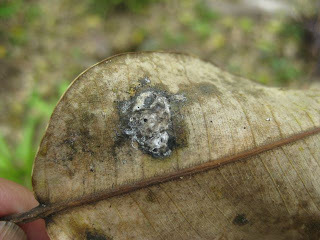 Yes, this had a common leaf sap sucker of figs – psyllid. There are many different kinds of fig trees, and most of us are probably familiar with the delicious fruit from the edible fig-tree or the latex extracted from the tropical variety that goes to make rubber. In our area we have nine figs that thrive in the rainforests – this is one of them – and they all have a tacky white sap. Hence the sticky stuff left by this sap sucker as it munches into the leaf. It sticks to your shoes like chewing gum. Under natural conditions psyllids are kept under control by birds and other insects that live in the leaf litter that accumulates under the tree. WHAT TO DO: Think how the tree grows in it’s natural environment and try to replicate it. 1. 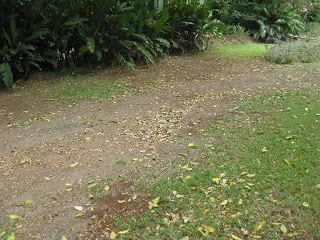 Do not have grass growing right up to the trunk of trees – grass is thirsty – it competes with the tree for water and nutrients. 2. Mulch under trees. I saw this as a simple solution to solving a fig psyllid problem, some years ago, when I worked at the Royal Botanic Gardens in Sydney. Mulch also provides the right environment for natural predators of the psyllid. (Mulch had been put under part of the tree a year or so ago, but it needed to extend out further from the trunk and be replenished. 5. Any environmental reasons for the tree to be under stress. Yes, we have had a long, dry winter. WHAT TO DO: We are coming into out wet season so watering probably won’t be necessary. If, however, you have a long, dry period – make sure your large trees are mulched (this help to retain moisture) and that they are adequately watered. 6. Check the pH levels of the soil around the tree. This was about 7.5 – a little alkaline for a tree like this – probably due to recent building works and run-off from them. In my experience, most soils around houses prove to be on the alkaline side – lime/alkaline products are a large component of concrete, mortar and other construction materials. WHAT TO DO: To correct the pH and give the tree a boost it would help to feed it. 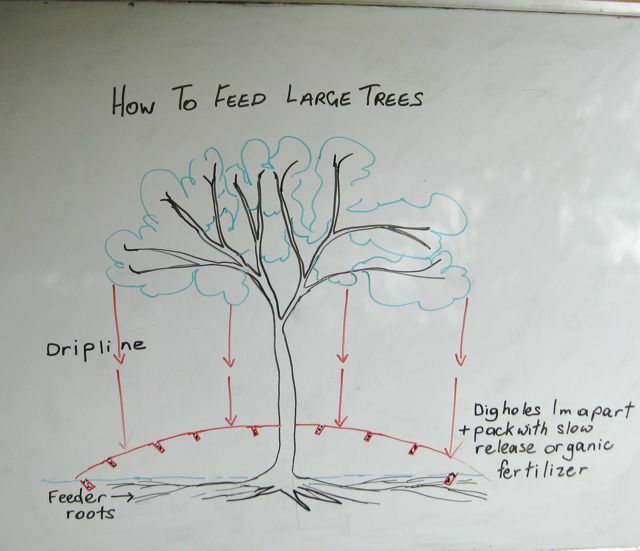 Correcting any nutrient imbalance will also help to make it more resistant to pest and disease attack Most of the feeder roots of the tree are around the drip-line so this is where you fertilize a tree. Going in a rough circle under the drip-line – dig holes, roughly the size a tennis ball canister, 1-2 m apart (depending on the size of the tree) and pack them full of an organic fertilizer. Like this, they act as a slow-release fertilizer and keep feeding the tree over a long period of time.